PA officials are fit to be tied over hints of compromise. Jewish supermarket owner Rami Levy meets with former Arab League head Amr Moussa. 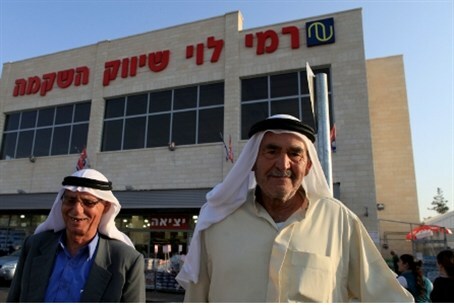 Palestinian Authority leaders are outraged over a meeting between Jewish supermarket chain owner Rami Levy, who operates stores in Judea and Samaria, and former Arab League secretary-general Amr Moussa in Shechem. The meeting was intended to "form an international coalition ... to break the deadlock in the peace process,” according to a statement. "This is not negotiations, nor economic cooperation, normalization, or bilateral talks ... but an international meeting under the banner of a global body, the World Economic Forum," the organizers said. Fatah official Mahmoud Ishtayeh charged that the presence of Levy in effect recognizes a Jewish presence in Judea and Samaria due to at least three stores he operates in the area, in addition to dozens elsewhere in Israel. He said that meeting with Levy contradicts the PA policy to boycott all products and goods from Jews in Judea and Samaria, according to Ma'an. The news site also quoted Bassam al-Salhi, the secretary general of the leftist Palestinian People's Party, as saying that the visit by the Israeli delegation undermined the boycott effort. Rami Levy’s supermarkets in Beitar Illit, Gush Etzion and in the Binyamin region of Samaria (Shomron) are unique because both Jews and Arabs work and also patronize the stores. Last August, Levy upset the Palestinian Authority when he spoke with Al-Masri about the 2002 Saudi Peace initiative, which has been adopted by the Palestinian Authority. The PA businessman said he met with Levy rather than with Israeli leftists because the “peace camp” has little influence on the public. Two weeks ago, several anarchists and Arabs rioted at the Rami Levy market in Binyamin.